There are many things that consume our time when we PCS. Tasks like selling or renting out a home, finding a new home, getting household goods moved from Point A to Point B, and traveling to a new duty station take up most of our energy. In fact, we’re likely so focused on the larger tasks in front of us that we forget the simple, yet essential, things that need to be done when we reach our new home. 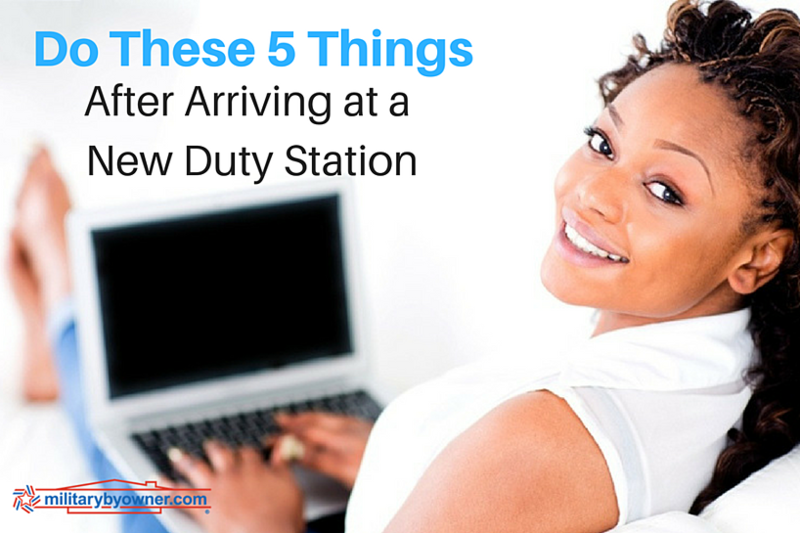 You'll want to do these 5 things after arriving at your new duty station. We don’t give DEERS much thought. Once we’re in the system and have our military ID, we have few interactions with them, which makes it easy to forget this step after moving. Since DEERS controls your eligibility for TRICARE, once you have a new address, you’ll want to update your contact information-- and you don’t need a sponsor for this, dependents can update their own information. To update your contact information with DEERS, you can log-in to MilConnect and update online or call 1(800) 538-9552. After you update your address with DEERS, you’ll need to call TRICARE and verify your updated address with them and get a new Primary Care Physician (PCM) assigned to you. If you update your information with DEERS over the phone, they can transfer your call. Otherwise you can call your TRICARE Regional Office. This is time-sensitive if you refill your prescriptions on base, since they can take several weeks to fill. If you refill at a civilian pharmacy, there is no need to do this until you need your prescription refilled. The pharmacy, especially if it’s the same chain (Walgreens, Walmart, Rite Aid, etc. ), can call for the transfer and have your prescription refilled in a matter of days. Hopefully, you put your mail on hold before your PCS. Now that you’re settled in at a new address, you need to submit a change of address with USPS. This is an obvious task that tends to be delayed during the moving process. However, with new bills coming in the mail and balances from previous utilities getting returned, you’ll want your change of address to be one of the first things you do after you move. You can either go into your local office and fill out a form or visit USPS.com and pay a small fee. I’m not a fan of standing in line at the post office so I pay the small fee--it’s worth the convenience. 5) Get to know your new duty station. Getting to know your new duty station right away will help you feel oriented. Learning where things like yours or your spouse's offices are, the on-base medical facility, commissary, and exchange are will prepare you for success when you need to utilize their services. You will also want to learn who your Family Readiness Officer is (or whatever it's called in your branch). Chances are, they will get in touch with you, and when they do, save their contact information for any questions or concerns you may have. Making a PCS move requires a lot of us. The government makes an effort to relieve a lot of the stress we feel, but there are certain tasks that we must do ourselves. As you try to sell or lease out your old home and search for a new one, don’t get too busy to remember these mundane but important tasks.